Details of South African homeschool support groups, egroups and websites. Homeschooling in South Africa has only been legal since 1994, so it is a new phenomenon in our society. 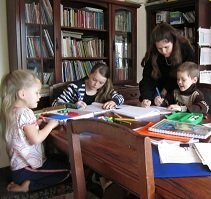 As a result, compared to other countries, like the USA, where it has been practiced for much longer, there are relatively few homeschoolers in our country. The numbers are increasing, but in some locations, homeschoolers find that like-minded families are few and far between. Many of us find our best South African homeschool support structures are online homeschooling communities. Online support groups are places that one can ask questions, get advice from more experienced homeschoolers and discuss the many family issues related to homeschooling. Footprints On Our Land - South African Homeschool Curriculum - All you need to know about homeschooling in SA and our homegrown South African Homeschool Curriculum - how to choose one for your family, homeschool FAQ's, articles, tips, advice for new homeschoolers, encouragement and more, by two veteran homeschooling moms - Shirley Erwee and Wendy Young. Eastern Cape Homeschooling Association - a great source of information, especially for new homeschoolers. Starting Homeschooling - webinars about starting homeschooling, preschool homeschooling and high school homeschooling. Pestalozzi Trust - Legal defence fund for home educators in South Africa. A literature-based unit study homeschool curriculum for ages 4-8 centred around the best of South African children's literature. This page includes a free printable sample lesson plan. An introduction to South Africa that can be used as part of an around the world, mulit-cultural preschool theme. This lesson includes Geography (mapwork), Language, Food, reviews of recommended South African Stories, two free printable literature-based lesson plans and more. Footprints On Our Land offers three literature-based South African curriculum packages in unit study format for multi-level learning. The links below will take you to the relevant page on the South African Homeschool Curriculum website.